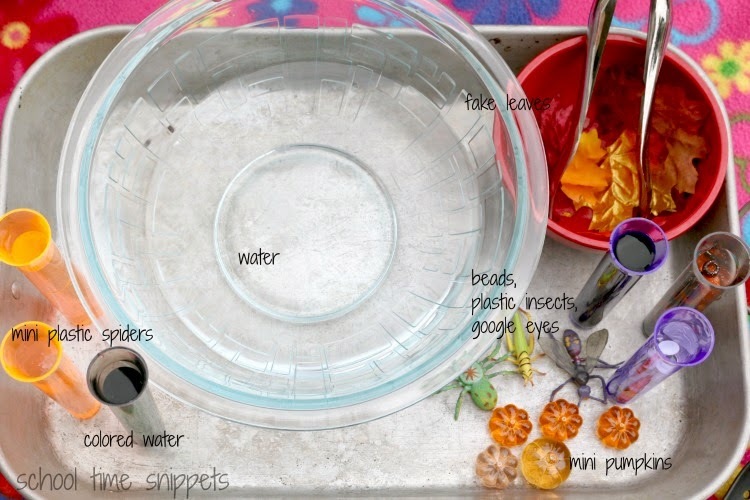 Try this simple Halloween sensory bin using water as an invitation to pour and scoop! Toddlers and preschoolers will love making their own Halloween "soup!" Water play is a great way to work on fine motor skills and provides a simple sensory experience for toddlers and preschoolers! 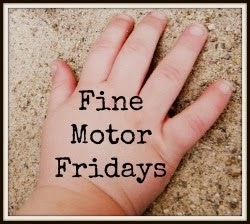 Today's fine motor activity was inspired by my latest trip to the Dollar Store! It's a mix of sensory fun and fine motor skills rolled into a festive Halloween sensory bin the kiddos will love! I picked up some Halloween colored test tubes and small spiders with the intention of a simple pouring activity for our "All Things Halloween" preschool theme, but quickly the idea morphed into an invitation to make some Halloween Soup! My kids never turn down getting to play around water! Engage in sensory fun with this simple Halloween inspired sensory soup activity! Small Halloween-ish manipulatives: spiders, googly eyes, black & orange colored beads, fake leaves, plastic spiders, glass-like pumpkins. To set up this water based Halloween sensory bin, I presented my kiddos with a bowl of water and the test tubes filled with colored water and manipulatives. "Let's make some soup!" I said. My 3 year old wasn't quite sure what to do or think, but surprisingly my 7 year old jumped in and started pouring, scooping, and mixing up a batch of "yummy" spider and eyeball soup! Shortly after, my 3 year old started playing, too. As I have mentioned, my kids never turn down a chance to play with water. For most I think water can be very soothing and being able to play and splash around provides freedom and exploration that little ones love. 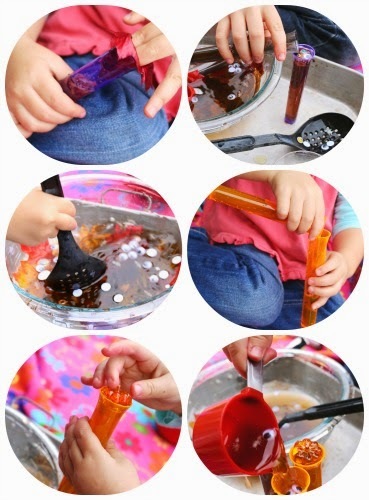 Why not turn water play into a festive sensory experience- like this- for Halloween?! I only wish that I had a larger water table to set up this Halloween water play activity!! p.s. If Halloween Soup isn't your thing, mix up some Bottle Cap Soup instead! 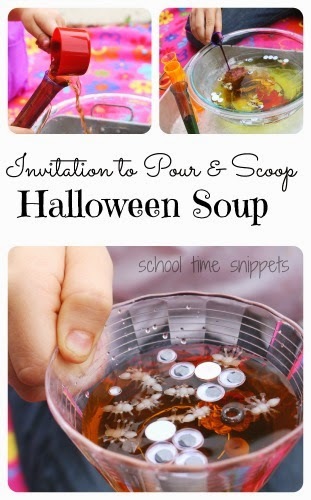 3 comments on "Halloween Sensory Soup Water Play"
oh this looks like a lot of fun! Perfect for these balmy Fall days we've been having! We love bottle cap soup - I bet this one would be a hit too! Love the googly eyes! This looks like a lot of fun!! Do you use something besides food dye to color the water? I always worry about food dye staining my students clothing. Thanks! !